If you are planning a wedding in the Roanoke area and are looking for a truly unique outdoor venue you must visit Sundara in Boones Mill. The grounds are immaculately kept and the charming space is one of the most romantic spots you will find to say "I do." Crystal and Clint described their experience as "a magical night." For their intimate gathering they chose a two tier "naked" cake decorated with fresh baby's breath and mint leaves. Both tiers were vanilla cake with mocha filling decorated with a vanilla buttercream. The Kokeshi cake topper was a hand-painted gift from a family member, such a lovely detail. I love the chalk board displayed next to the cake with a the beautiful quote "Always remember, there was nothing worth sharing like the LOVE that let us share our name." Pure happiness while cutting their cake. These two are completely, hopelessly, deeply in love. A BIG thank you to Cardinal Studios for sharing their beautiful photos. Congratulations Crystal & Clint!! Classic, elegant and romantic are just a few words that I would use to describe Jennifer and John’s wedding. Their lovely wedding was held at Chateau Morrisette Winery in Floyd Virginia. For the wedding cake, each tier was covered in a rustic buttercream design and fresh flowers were added to the top and sides. The cake was displayed on a white pedestal stand and set up in front of double door leading out onto the indoor terrace. On the inside: Vanilla bean cake with vanilla bean filling; Strawberry cake with a fresh strawberry filling and Lemon cake with lemon curd. Jennifer also wanted to incorporate a grooms cake for John into their reception. I created a simple two tier naked cake covered with fresh berries. I just love the custom cake stand that she provided for the cake display. Vanilla cake with white chocolate filling and a fresh raspberry puree was enjoyed by the guests who had a slice of the grooms cake. Lastly each guests enjoyed a custom made Virginia shaped cookie as a favor to take home. As take on the "Virginia is for Lovers" theme I placed a pink heart over Floyd on each cookie to symbolize their love. And a cake cutting picture because that is my favorite part :) This photo doesn't disappoint, I love John's expression! A big "Thank You" to Natalie Gibbs for sharing her beautiful photos. If you are still looking for a photographer for you big day take a peek at her website, Natalie Gibbs Photography her work speaks for itself. Why Are Wedding Cakes So Expensive? This is a common questions asked by couples when they start planning and setting up their wedding budget. It is just flour and sugar, right? Not quite. There is a range of things that go into creating a wedding cake, the ingredients being only a small part of the equation. You are paying for an experienced baker to create a delicious cake, that is structurally sturdy, artistically decorated and expertly delivered without damaged. (And if it is damaged, someone who has the experienced needed to repair it on site) Quality ingredients, labor and delivery are the three main reasons why wedding cakes carry a higher price tag. Using high grade butter, premium chocolate and fresh fruit adds up quickly for a cake to feed 100 people. A four tier wedding cake, decorated with swiss meringue buttercream, contains about 10 pounds of butter and almost 7 dozen eggs! Not to mention 5 pounds of pastry flour, 10 pounds of sugar, real vanilla and several other quality ingredients. If you order a fondant covered cake, you can add about 8 pounds of fondant to the list. Even if you are bad at math you can see that wedding cakes are very heavy. (I lift weights so I can lift cakes!) For this reason there are also structural items, cake boards and cake drums needed to create a support system so your cake will not collapse under its own weight. Did you know that a simple four tier wedding cake takes between 12 and 15 hours to create? Baking, icing, stacking and decorating a perfectly level cake takes time and practice to achieve. This is not counting the time it takes to bake samples and set up tastings/consultations with a couple. Handling contracts, answering emails and returning calls for a wedding order can also be very time consuming. Setup and delivery, as well as working with the couples wedding vendors to ensure the wedding days goes smoothly, adds a few more hours to the process. Taking all this into consideration, your cake baker is making very little per hour to create the wedding cake of your dreams. The entire process for a cake to feed 100 people is a time commitment of about 20 hours for your baker. Most wedding cake bakers will agree that delivery and setup is the most stressful part of the process. Not only do you have to deal with unpredictable weather and heat but also crazy drivers on the way to the wedding venue. I have considered getting a big sign for my car that says “STAY BACK 1,000 FEET” or "DON'T HIT ME OR YOU WILL RUIN SOMEONE'S WEDDING DAY" for all the tailgaters out on the road. Once arriving safely at the venue, setting up the cake takes around 45 minutes. Setup includes leveling the table, finding the cake stand, locating the flowers, talking to the venue owner and finally actually setting up the cake! Contrary to popular belief it is not a “drop and run” process and just adding flowers to a cake can take over 30 minutes. So there you go, everything you need to know about the cost of a wedding cake. It’s a wonder that it isn’t much more expensive. If it were marked up in the same manner as a wedding gown or some of the other services you purchase for your wedding, it would be! If you are still looking for an experienced baker to create your wedding cake please take a moment to view my gallery for design inspiration or contact me for a complementary tasting. I took a solo trip to Powhatan, Virginia to deliver this very special buttercream cake for Christina and Derrick's wedding, at the stunning Fairview Farm venue. They enjoyed a perfect spring day in the 60's with sunny blue skies. I adore the setup for the wedding cake in front of a rustic fireplace! They also had a beautiful wine barrel topped with large round piece of glass and a sliver cake stand to display the cake. The bride's mother Mary Jo, who is a florist in our area (Gloriosa), added fresh flowers in shades of pink and white to the sides and top. They topped off the cake with a personalized cake topper and set the table with a golden overlay. For the cake flavors the couple chose alternating layers of white cake with strawberry filling and chocolate cake with mocha filling. The cake was decorated with swiss meringue buttercream finished in a textured style. If you are still looking for a professional to make your wedding cake in Roanoke, Salem, Vinton, Blacksburg or Radford Virginia call me at 540-493-6812. Take a moment to check out my wedding cake gallery and see what other couples are saying in Roanoke, Virginia about their wedding cake experience. I am one of the most popular wedding cake bakers in Roanoke, Virginia and I would love the opportunity to work with you on the most important day of your life. Tasha and Michael enjoyed a beautiful spring day for their wedding at The Kyle House in Fincastle Virginia. They chose a four tier smooth buttercream wedding cake decorated with a burlap lace ribbon and a cascade of fresh calla lilies, roses and baby’s breath. The cake was alternating flavors of Chocolate Espresso and Strawberry cake...yum! I especially loved the Willow Tree topper. Hiring the right team is critical to planning your dream wedding…and it can also be quite stressful. How do you find the right match for you? How do you know who to trust? Where do you go for advice? First of all, this is not an easy task and it’s totally normal for couples to feel overwhelmed, frustrated or confused.It’s not like you plan a wedding every day! This is all probably brand new to you, so be patient with yourself. You’ll get much more out of a meeting or conversation with a wedding professional if you do a little background homework first. Spend some time on the internet or talking to friends who’ve recently been married. Find out the average prices in your area and what services are available. Get an idea of what you like and don’t like. Wedding websites and chat rooms can be a great resource. This way when you meet with a wedding professional you’ll be able to ask better questions and have an idea of what to look out for. An in person meeting is the best way to interview a potential wedding vendor. It lets you get the full experience of their personality, style and professionalism. If that’s not possible, have a phone conversation. There are no stupid questions! Make sure you get clear, specific answers to your questions. If you aren’t sure what something means, ask them to clarify. Keep asking questions until you completely understand. If a wedding vendor has a problem with you asking questions, they probably aren’t the one for you. The best wedding professionals are patient, understanding and take the time to help you make the best choices for your wedding. Don’t just hear the words they say, really listen. Watch the vendor’s body language. Are they confident and comfortable with their response? Do they look and sound nervous? Do you get a “funny feeling” about them? Take all the sights, sounds and feelings into account along with their responses; if your gut tells you something isn’t right, it probably isn’t. Portfolios are hand-picked to show off the best work, but they may not represent the “average” wedding performance. Videos are edited for the optimum presentation. But real referrals from satisfied clients are hard to fake. Websites like theknot.com and weddingwire.com can provide a wealth of knowledge and real client referrals that can't be altered by the vendor. Ask the wedding vendors that you have already booked for professional references if you are unsure of a certain vendor. Ask questions and use those listening skills. Even if they give a rave review, you’ll often be able to “read between the lines” if there were any issues or problems. Weigh all of this information into your choices. How many weddings do you do per year? How much experience do you have? This is an extremely important question. Ideally, your wedding professional should have ample experience specifically with weddings. Not only will they be more skilled in their craft, this also makes them a valuable source of information and ensures that your wedding day goes smoothly. How much do you cost? Price is often relative, especially when you factor in experience, reputation and expert skill. Generally, the most talented professionals have a higher price tag because they are worth it. What specifically is included in that cost? Because packages often vary, it’s likely that you won’t be able to compare one vendor exactly to the next without doing a little figuring. The lowest cost isn’t necessarily the best deal; some higher quotes include services that you have to pay extra for in other packages. Make sure you take this into account. What happens if I cancel? What happens if you cancel? Find out if your deposit is refundable under any conditions. Does the wedding professional have a back up plan if something happens to them? Do you use a contract? If the answer is No, RUN! A contract is designed to protect both you and the wedding professional. Don’t settle for a verbal agreement that won’t hold up in court. Are there any additional fees? Taxes, service charges and travel fees can add up quickly. Make sure you understand exactly what is included and if there are any other fees you’ll have to pay. This should be clearly defined in your contract. If chosen wisely, with the right wedding vendors you get expert help and advice…for free! If you are still looking for a professional to make your wedding cake in Roanoke, Salem, Vinton, Blacksburg or Radford Virginia call me at 540-493-6812. Take a moment to check out my wedding cake gallery and see what other couples are saying in Roanoke, Virginia about their wedding cake experience. I am one the the most popular wedding cake bakers in Roanoke, Virginia and I would love the opportunity to work with you on this very special occasion. Glitter makes everything better, including your wedding cake. Metallic’s have been popular on everything from stationary to decor and this year it is big for wedding cakes. If you are bold, you could pick a wedding design using edible 24k gold paint, silver leaf or indulgent sugar crystals. Add sparkle and shine to your cake by asking your baker to use luster dust on the sugar flowers or to dust the entire cake for a decorative sheen that will not overpower the design. It is not hard to see why luster and metallic are such a popular wedding cake trend for 2016. If you are still looking for a professional to make your wedding cake in Roanoke, Salem, Vinton, Blacksburg or Radford Virginia call me at 540-493-6812. Take a moment to check out my wedding cake gallery and see what other couples are saying in Roanoke, Virginia about their wedding cake experience. I am one the most popular wedding cake bakers in Roanoke, Virginia and I would love the opportunity to work with you on the most important day of your life. Semi-Naked cake topped with fresh cherries, blackberries, red pears and dried dates. "Naked" wedding cakes are a continuing trend from 2015 that are extremely popular in the Roanoke, VA area this year. This trend is popular for outdoor or rustic settings and elegant Virginia vineyard weddings. Instead of frosting the outside of you wedding cake with layers of fondant or buttercream, I simply increase the filling between tiers and leave the cake layers exposed, for a fresh (and delicious!) look. You can opt for a completely "naked" look or a "semi-naked" cake as shown in the photo. This exposed look is popular with couples looking for a traditional wedding cake alternative or a wedding cake to fit a rustic Virginia wedding. To up the style factor for your wedding cake you can add fresh flowers or beautiful season fruit in your coordinating colors. Saying "I do" in the fall or winter? 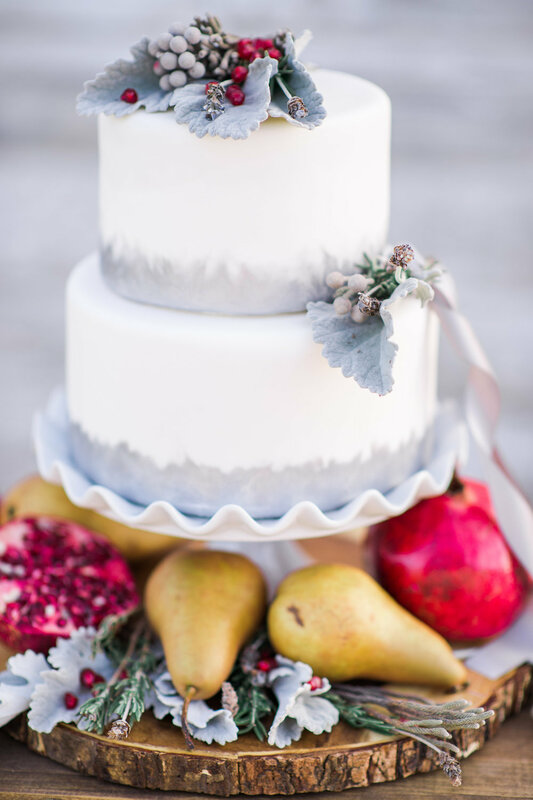 Naked cakes are gorgeous covered with sugared fruit and cinnamon sticks or dripping with white chocolate ganache. Several small naked cakes would also look great on your wedding dessert table or a red velvet naked cake to celebrate your holiday nuptials. The old saying, "It's what's on the inside that counts" certainly applies to this wedding cake trend! New Years Eve Surprise Wedding! Happy New Year! One of my new year's resolutions is to start writing a blog about my wedding cakes and all the wonderful people that I meet along the way. This beautiful cake was technically my first of the new year since the couple decided to surprise their friends and family by getting married at their New Year's Eve party. So much fun! For the surprise wedding I created a cake decorated with a handmade clock, fondant pearls and golden curlicues. The guests were served vanilla cake with a buttercream filling and the top cake, the grooms favorite, was red velvet with a buttercream filling. The cake was delivered to a gorgeous loft in downtown Roanoke, VA own by one of the couples friends. A big Congratulations to Michael and Misty!